A remarkable setting required careful placement of residence, guest quarters and garage. 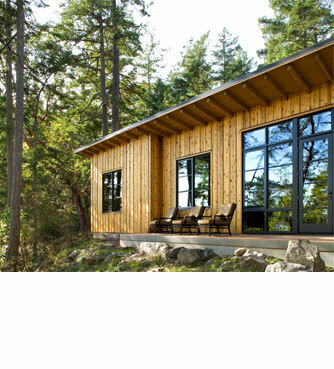 Set in a lush conifer forest, the guest house accommodates two bedrooms, sitting area, powder room, full bath and warming kitchen. Interior hemlock walls and cabinetry and warm-colored concrete floors compliment cool, gray days. The floor extends outside to a plinth-like patio overlooking the water. Articulated vertical cedar and cor-ten steel siding will naturally weather and change color over time. The main house, currently under construction, replaces an existing structure. The previous residence was carefully dismantled for materials reuse within the local community, and salvaged woods will be incorporated in the new interior. A catchment system retains water for landscaping and non-potable needs within the house. Expansive glass provides close views of the water and forest as well as long views across the bay to the Cascades. Minimal site disturbance and protection of natural vegetation serve to integrate the structure with the site.